Over the past couple of decades, an increasing number of foreigners have wanted to invest their hard earned money in Mexico by purchasing a property. However, most people not only want to own a home in this beautiful country, but they are looking to invest in any of the gorgeous beach towns and cities that Mexico has. The number of American expats migrating to Mexico has grown exponentially because the costs of living in Mexico for retirees are much lower than those of living in the United States. The 1917 Mexican Constitution did not allow foreign investment to be made on Mexican lands. According to Article 27 of the Constitution, a non-Mexican citizen is unable to own property (by holding a real estate title) within certain areas determined as the “restricted zones”. 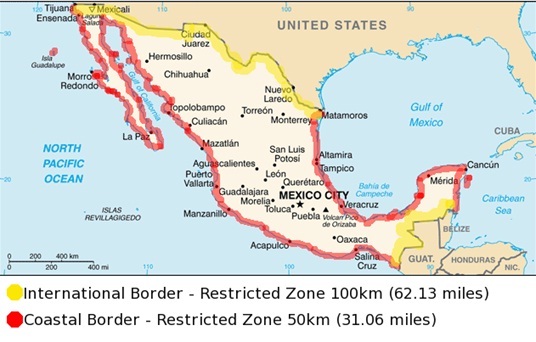 The restricted zones are any area within 50 kilometers of any coast, or 100 kilometers of any neighbouring border. However, without foreign investment, these areas – specifically Acapulco, Puerto Vallarta, Los Cabos and the Riviera Maya – would not grow as fast and steady as they have. To allow foreigners to invest in the area, the Mexican government passed a law in 1973 called “Foreign Investment Law” which allowed foreigners to safely purchase land and properties in Mexico. There are two ways of owning property in the restricted zones of Mexico: through a bank trust (or Fideicomiso), or through a Mexican Corporation. The Fideicomiso is a bank trust where the bank, or trustee, holds the trust deed for the purchaser, or beneficiary. In this case, the bank is the legal owner of the real estate in question; however, the purchaser has all ownership rights and freedom to do with the property as they please: sell, lease, mortgage, pass on to heirs, remodel, paint, amongst others. The trust is granted for a period of 50 years and is renewable for additional 50-year periods. The trust can be transferred to another beneficiary who can either wait for the remainder of the 50-year period to come to a close, or renew it upon receiving it. Since 1995, foreigners can operate a Mexican corporation aimed at purchasing and developing land for commercial use. The only limitations are mining, airports and telecommunications. However, should a foreigner wish to invest in land or properties to sell, resell, or rent, a Mexican corporation allows them to do so. There are also no limits as to where in Mexico they can invest. The two most common types of corporations are Limited Liability Corporation and Limited Liability Partnerships. Choosing which corporation works best for one’s benefits depends on tax purposes both in the United States and in Mexico. Once the corporation is formed (by two or more foreign partners), they are free to purchase property and acquire title insurance. When deciding whether to use a Bank Trust or Mexican Corporations it is best to consult with a reputable lawyer. Your lawyer will discuss the pros and cons of each and depending on your personal needs and wishes for your property; you can decide which safe-investment method is best for you. Thomas, from Indiana, is a graduate from the prestigious Krannert School of Management at Purdue University, where he obtained a degree in Administration with the Financial Management option. 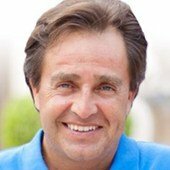 He has been working professionally in Mexico since 1995, and in 2011 he was the first person to ever attain a new nationally regulated Real Estate degree and professional identification number for the Country of Mexico. In 2009 he was voted Realtor of the year, because of his professionalism, attention to customers and knowledge of procedures and the market. Also, he has been active in the real estate community serving on the real estate association’s Honor and Justice Committee. Thomas founded TOP Mexico Real Estate to help non-Mexicans have an enjoyable and safe experience as they purchase and invest in real estate in Mexico. The Fideicomiso is a complete money grab by the banks, one must wonder why the government isn’t controlling this and keeping the money for themselves. The bank charges you approx.$650 usd to do the initial paper work and then approx. $550 usd every year to change the date. Mexicans can purchase property in Canada and the USA outright, there are no restrictions. A class action law suit should be filed against the mx govt. according to NAFTA rules. There was a bill a few years ago, by the MX govt. to eliminate the bank trust but official time ran out, I think the BIG BANK LOBBYIST got this bill cancelled. They hate giving up money.